Join Claire for a small & intimate, 4 night late Summer Ashtanga yoga retreat in the beautiful French Pyrenees. Our host, La Taillede, is a beautifully restored ancient Catalan farm house in the French Pyrenees, sitting proudly at 950m altitude. 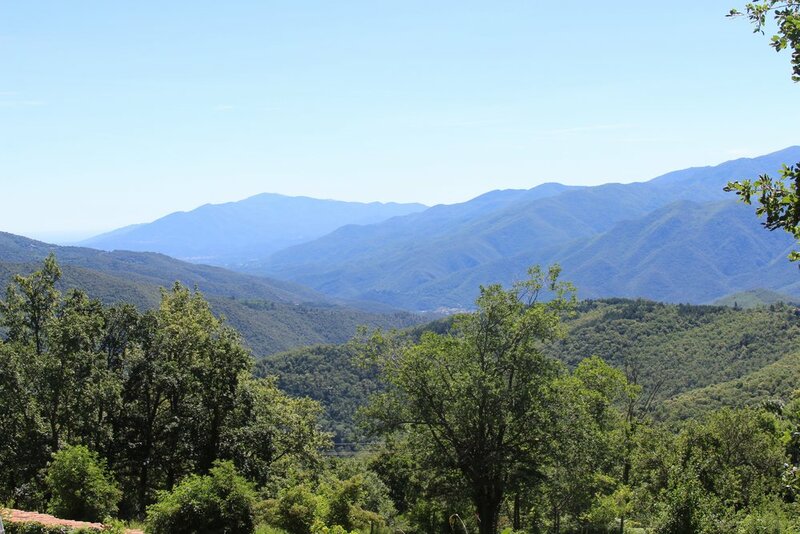 Framed by Mount Canigou, the beauty of La Taillede is its prominent mountain setting, the incredible views all the way down to the Mediterranean sea, the fresh air and being surrounded only by nature. We will be staying in 2 luxurious ‘gites’ each with it’s own terrace, inside and outside communal seating areas and kitchen. There is a wood fired hot tub, a fire pit, hammocks in hidden spots in the forest, and plenty of areas to take in the magnificent views. We will be very well looked after by Ali and Dani; both ex-super yacht chefs, specialising in healthy, organic vegetarian cuisine. Using only the best local ingredients, many from the farm (eggs from their own chickens, vegetables, salad, mushrooms from their forest, fruit from their orchard, fresh herbs for teas and cooking) and local sheep’s cheese from a neighbouring farm in Corsavy. We will have 4 morning classes as well as 2 afternoon workshops together, leaving you some free time to explore the area as well - or simply relax! The morning Ashtanga yoga classes will be a mixture of Mysore & Counted classes. Afternoon workshops will be an opportunity to explore techniques together; they are fun and interactive but will always be grounded through chanting & pranayama. Yoga will be held in the yurt, but if too cool we will move indoors where the wood burner will keep us warm. This will be a small retreat allowing us the opportunity to really work together (8 students). All yoga classes & workshops will be taught by Claire Berghorst, a senior Ashtanga yoga teacher who has been teaching on a full time basis for over 10 years, and practicing much longer! We are spoilt for choice with hikes / nature trails, many starting from the house, or simply relax in the hot tub or one of the forest hammocks. We are a 15 minute walk down a rural track from the quaint, traditionally French mountain village of Corsavy. There is a cafe/village shop, 2 restaurants and a post office. Amelie les Bains, famous for its natural hot springs and spa treatments is 25 min drive away. Ceret is a beautiful town with lovely cafes and restaurants, a vibrant Saturday market and art museums; 30 minutes by car. The Mediterranean sea is a 1 hour drive away, and the Spanish border only 30 minutes by car. Early bird price of £560 when booked before 30 April, therafter £620. Early bird price of £620 when booked before 30 April, therafter £680. Early bird price of £770 when booked before 30 April, therafter £850. Limited availability in each category; first come first served. Your place is secured with a £200 non refundable deposit. Full balance due by 10 June 2019. The price includes: All Yoga, accomodation for 4 nights, brunch, snacks and dinner (with a glass of wine if you so wish), as well as tea, coffee & juice. The price excludes: Flights and transfers. Non Yogi partners are welcome to join, please contact Claire for pricing.